Faith Based Art – Welcome! 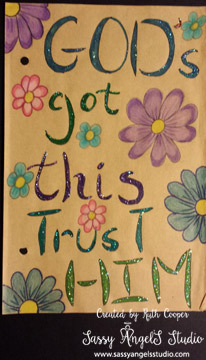 Welcome back to my blog & the Amazing Journey Blog Hoppers Faith Journey Hop! If you arrived here from Carol’s blog then you are right on track. If not, no worries, keep hopping & you’ll come full circle. How we express our faith is different & unique to everyone. I usually don’t post a lot of “religious” stuff. I try to live by, though imperfectly, the 2 commands Jesus gave us. To love God with all our heart, soul & mind and to love our neighbors. Being the hands & feet of Jesus by loving & serving others is my small part in this world & it’s taken me a long time & a lot of grace to discover this. One of the ways I absolutely have always loved to share is by encouraging others. Everyone can use a smile, kindness, thoughtful deed or some other small act to brighten their lives. During October, Fun Stampers Journey is hosting a Be Brave Card Drive for breast cancer patients & their caregivers. Anyone battling any type of cancer is in for a rough road & faith can play an important part in the patients or their families journey. 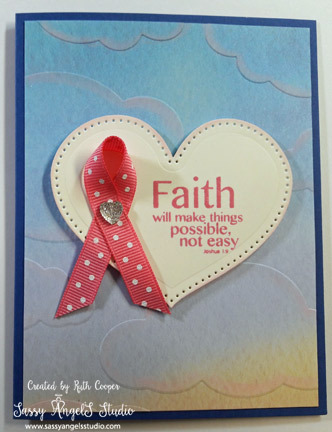 So I chose to make a pink ribbon card & use the Through the Storm stamp set. Pink cards don’t have to be all pink. I used Huckleberry Fusion for the card base. The designer paper is a lovely ombre from the Party Pop Prints paper pack. I embossed the print with the Above the Clouds embossing folder & then highlighted the edges of the clouds with Bubble Gum Panpastels. I used the Heartfelt dies & piercing elements for the heart, which I also edged in Bubble Gum Panpastel. The sentiment is stamped in Watermelon Fusion & the heart is popped up with Journey Foam Squares. Unfortunately, I realized I had not yet purchased any FSJ pink ribbon so I raided my sewing stash for the ribbon & added a Sparkle Heart embellishment to the center. Pink ribbon will definitely be on my next order. I’ll send this card off with a prayer that it brightens up the day for a patient or their family. Your next stop is Kim’s blog. Make a difference & share a little love. Do something special this week to brighten someone’s day. Yesterday’s drive home proved interesting. We spent the week in Branson trying to relax & well the resort wasn’t the greatest. We booked too late to get into one of our favorites so tried a new one, big flop. So we decided to come home a day early & enjoy the drive. We headed towards Springfield for gas, lunch & a bit of shopping. We decided on Logans Roadhouse for steaks. Our waitress seemed a bit ditzy & was definitely slow but the food was good. I usually pre-bus the tables by stacking our plates & cleaning up (comes from having a daughter who waitressed). Well hubby tried to help & in the process knocked his full glass of coke over, giving me a coke bath. I told him “thanks, I love you too”. Now wet & cold, we both stand up next to our booth & attempt to mop the spill with our 2 small paper napkins. Our waitress comes over & asks if we are ready for dessert? Really? There’s a huge spill, we are standing by the table & she’s oblivious. Me: No there’s been a spill & we need clean up. Waitress: Oh, well. Would you like to-go drinks? Ha-ha-ha. Obviously she’s on another planet. Hubby goes out to the car for my duffle so I can put on dry clothes & our waitress returns with our check & asks if I’d like a couple of napkins to dry off. Really? I don’t think napkins are going to do any good at this point. There were diners at the table next to us, so in an effort not to disturb them further, I move around the corner towards the hostess station. The hostess asks if she can find our waitress, when the manager appears, politely says take all the time you need to clean up, processes our check & then makes our waitress bring it to me. He shouldn’t have bothered, she still wasn’t on this planet. Waitress: Oh just sign this & leave it wherever. Really? You don’t care where we leave it. Maybe you don’t want the meal paid for or a tip? Hubby returns, I head to the ladies room for much appreciated dry clothes & after cleaning up found my still apologetic husband & headed out to shop. Our waitress wandered by one more time & said I guess I’d better pick up your ticket, all while acting like that simple task was such a huge effort. Who knows, maybe she was still hung over from the New Year’s Eve celebrations. (PS. I still gave her a decent tip. The food was good even if her overall service was scatterbrained.) Lunch was good for a laugh even if I was a bit inconvenienced & didn’t get to finish my cinnamon apples. We decided to head over to the local Lifeway Christian Store. We’ve always loved poking around in bookstores. I decided to finally invest in my first journaling Bible. 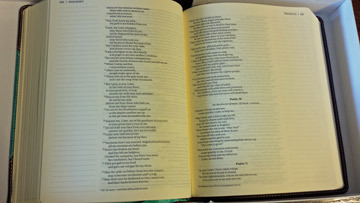 Zondervan just released a new NIV with slightly thicker pages. I have had a debate for awhile on whether or not I needed another Bible especially one just for journaling. I enjoy art in all forms, can do a bit of decorative lettering in the very small margins of my The Voice Bible, am always willing to create on whatever is handy whether it’s plain old paper or a sketchbook. After seeing so much art on the local Facebook Journaling Bible community, I decided that I would like to do some special art in a journaling Bible. So here it is…..
It’s actually a deeper blue than this but the natural lighting was off today. Now to take the plunge & design something for it. By the way, Lifeway Christian Stores are having a free Bible Journaling event Jan. 12th. 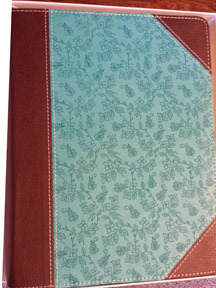 Check with your local store for details if you would like to explore more about Bible journaling. I doodle from time to time during sermons. I sketched this page out awhile back but finally added color to it recently. And the bookmark was a free download offered by a member of the Facebook Bible Journaling Community as a set of 4 different words. I printed it out & colored it on a slow afternoon volunteering at the Salvation Army. Enjoy the Weekend & Find some time to be creative this week!